A collapse is triggered by the emptying of the magma chamber beneath the volcano, usually as the result of a large volcanic eruption. If enough magma is ejected, the emptied chamber is unable to support the weight of the volcanic edifice above it. A roughly circular fracture, the ring fault, develops around the edge of the chamber. Ring fractures serve as feeders for fault intrusions which are also known as ring dykes. Secondary volcanic vents may form above the ring fracture. As the magma chamber empties, the center of the volcano within the ring fracture begins to collapse. The collapse may occur as the result of a single cataclysmic eruption, or it may occur in stages as the result of a series of eruptions. The total area that collapses may be hundreds or thousands of square kilometers. If the magma is rich in silica, the caldera is often filled in with ignimbrite, tuff, rhyolite, and other igneous rocks. Silica-rich magma has a high viscosity, and therefore does not flow easily like basalt. As a result, gases tend to become trapped at high pressure within the magma. When the magma approaches the surface of the Earth, the rapid off-loading of overlying material causes the trapped gases to decompress rapidly, thus triggering explosive destruction of the magma and spreading volcanic ash over wide areas. The lava of explosive calderas is called A'a. Further lava flows may be erupted. 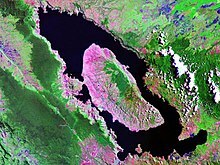 If volcanic activity continues, the centre of the caldera may be uplifted in the form of a resurgent dome such as is seen at Cerro Galán, Lake Toba, Yellowstone, and so on, by subsequent intrusion of magma. A silicicor rhyolitic caldera may erupt hundreds or even thousands of cubic kilometers of material in a single event. Even small caldera-forming eruptions, such as Krakatoa in 1883 or Mount Pinatubo in 1991, may result in significant local destruction and a noticeable drop in temperature around the world. Large calderas may have even greater effects. About 75,000 years ago, this Indonesian volcano released about 2,800 km3 DRE of ejecta, the largest known eruption within the Quaternary Period (last 1.8 million years) and the largest known explosive eruption within the last 25 million years. In the late 1990s, anthropologist Stanley Ambrose proposed that a volcanic winter induced by this eruption reduced the human population to about 2,000 - 20,000 individuals, resulting in a population bottleneck (see Toba catastrophe theory). More recently several geneticists, including Lynn Jorde and Henry Harpending have proposed that the human race was reduced to approximately five to ten thousand people. Whichever figure is right, the fact remains that the human race seemingly came close to extinction about 75,000 years ago. Eruptions forming even larger calderas are known, especially La Garita Caldera in the San Juan Mountains of Colorado, where the 5,000 km3 Fish Canyon Tuff was blasted out in a single major eruption about 27.8 million years ago. At some points in geological time, rhyolitic calderas have appeared in distinct clusters. The remnants of such clusters may be found in places such as the San Juan Mountains of Colorado (formed during the Oligocene, Miocene, and Pliocene periods) or the Saint Francois Mountain Range of Missouri (erupted during the Proterozoic).